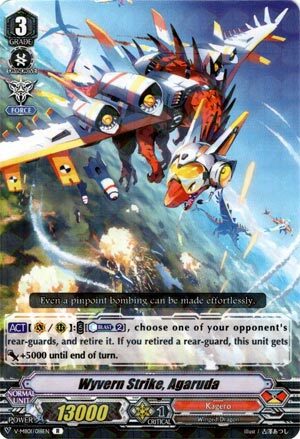 [ACT](VC/RC):COST [Counter Blast (2)], choose one of your opponent’s rear-guards, and retire it. If you retired a rear-guard, this unit gets [Power]+5000 until end of turn. Nice if you’re on a budget build, but not worth running over Waterfall and Overlord. The Counterblast sink is too much frankly and you don’t want to waste Aermos because it’s a 24k column with Berserk (anticipates damage triggers to a degree) and the Spillover combo is pretty tasty. Pass until the next wave of support pans out. At least it has Force Gift.